The contemporary appearance of Furness Abbey in the county of Lancaster. The splendid ruins show how much the Abbey has changed from its original condition. It was founded in 1127 by Stephen, first the count of Boulogne and of Mortain [Normandy], later King of England. The Abbey originally recognized the Order of Savigny under the rule of St. Benedict. Shortly thereafter, however, they ascribed themselves to the Cistercians. When it was dissolved, the Abbey handed over its property along with its annual revenues of 966.7.10 to the Royal Exchequer. In 1727 AD, the Society of Antiquaries of London undertook to engrave in copper this drawing made by order of the Most Noble Prince the Duke of Montagu. Engraved by George Vertue after an anonymous drawing. This plate lacks the conventional signatures found in the lower left- and right-hand corners of many plates, but Vertue is named as the engraver in the minutes for 4 June 1727, when the first 150 prints were ordered (SAL Minutes I.212). 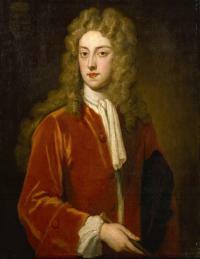 The caption indicates that the original drawing was commissioned by John, 2nd Duke of Montague (1690-1749), but this circumstance is not mentioned in the minutes. Montague was elected to fellowship in the society in 1725, and may have shown this drawing at a meeting in November 1726, when the engraving was ordered; he may even have suggested himself that this drawing be engraved, as the caption seems to imply. The print marks the 600th anniversary of the abbey’s foundation. It was re-engraved by J. Bayly for Thomas West’s Antiquities of Furness (1774). The print shows the ruins of the east front of the abbey church at Furness, Lancashire, together with the chapter house immediately to the south (left) and the infirmary chapel (far left). The visible portions of the abbey church date from the later 15th century, while the other two structures date from the thirteenth century. Between the chapter house and chapel, a portion of the cloister may be indistinctly seen in the background. This view does not show the five ornate Romanesque arches of the cloister’s eastern range, by now perhaps the abbey’s most celebrated surviving features, but only visible from the west side of the chapter house. The print also shows a number of modern structures, most notably the manor house to the north (far right) with its formal gardens. This manor dates from about 1670 and became the Furness Abbey Hotel after a railway station was built near the abbey in 1845, but was demolished in 1954 (Wood 2008: 11, 17). The many deer indicate the use of the abbey precinct as a deer park in the eighteenth century. The print includes five human figures, most notably the draftsman in the middle foreground. Founded in 1127 on this site, now known as Barrow-in-Furness, Cumbria, this Cistercian abbey—the second-wealthiest in England after Fountains Abbey —was suppressed by Henry VIII on 9 April 1537. Construction of the presbytery and crossing was complete by 1170 and the nave was complete by 1200. Work on the east front and west tower continued intermittently through the fifteenth century. The church roof and windows were dismantled within three months (Wood 2008: 10) and eventually Thomas Preston purchased the property from the Crown. It remained in the Preston family until 1756, when it was inherited by Lord George Augustus Cavendish (d. 1794), who is credited with the earliest efforts to preserve the abbey ruins (West 1774: 262-63). A stone buttress supporting the north transept dates from his tenure; iron and concrete reinforcement was added beginning in 1884 (Wood 2008: 24); and a major structural stabilization was carried out by the Office of Works beginning in 1923 when the state acquired the property from the Cavendish family. Among other changes over time, the print shows an arched roof on the now roofless rear portion of the chapel and shows the second story of the chapter house in a more complete state (only the middle section of the upper story remains). In this plate Vetusta Monumenta returns to the medieval subject matter that dominated the first seven years of the series. The ten prints published in 1725-26 focused on the Tudor period, particularly the reign of Henry VIII. The print of Furness Abbey, published in 1727, marks the 600th anniversary of the foundation of the abbey, and the majority of the prints published over the next ten years again focus on medieval subjects. Furness is the last of the four abbeys depicted in Vetusta Monumenta vol. 1 (1718-1747), though second only to Fountains Abbey (ix-xii) in historical importance. Coincidentally, the first two depictions of Furness Abbey, both of the east prospect, appeared in the same year. The other engraving, by Samuel and Nathanael Buck, was an accident of their itinerary, which took them through this region in the process of creating the third annual number of their Collection of Engravings of Castles and Abbeys in England (1725-39). Vertue had used the Bucks’ drawings of Fountains Abbey for Vetusta Monumenta in 1723, before their own series was fully launched, but the Furness Abbey engraving sets itself apart by marking the 600th anniversary self-consciously as an epoch: the building of the great abbey church, representing the apogee of English monastic culture, makes a fitting subject for an antiquarian print conceived as the state of the art in preservation, a permanent modern record of “ancient grandeur and religious pomp” (West 1774: Dedication). The same words could be used to describe an explicitly Catholic revival of 1927, when hundreds of pilgrims marked the 800th anniversary by processing to Furness Abbey to hear mass read by Cardinal Francis Bourne. In style, this print most closely resembles the print of Walsingham Abbey (commentary for Plate VI): the abbey is of interest to the artists as an archaeological site, but perhaps even more so as the feature of a picturesque landscape. In this way, the print anticipates the aesthetic orientation of descriptions by Thomas West, Ann Radcliffe, and others later in the century. In making this engraving, Vertue would seem to have followed the stylistic choices of the unknown draftsman, whose approach resembles that of J. Badslade in the Walsingham print. (Close scrutiny of the engraving, however, reveals richer architectural detail in this print.) With its topographical approach, this print is one of the first in the series to display the “fissure” noted by Martin Myrone between “antiquarian exactitude” and “aesthetic pleasure” (2007: 113), leaning toward the latter. West, however, noted that this “elegant east perspective view . . . taken by the Society of Antiquaries,” followed by his own ground plan of the ruins many years later, took the essential first steps toward clearing up the “confused idea of the premises” that had appeared in travelers’ recollections (West 1774: 2). A comparison with the Bucks’ engraving of 1727 gives a clear sense of this print’s superior accuracy. The viewer’s distance from the landscape, standing behind the draftsman, guarantees a certain prominence to the modern house at right, which is echoed by the cluster of deer in a patch of sun on the hillside directly opposite. In this respect, the print may be seen to offer a version of the narrative of improvement associated with topographical depiction: reading left to right, the compact modern manor completes the trajectory suggested by the wild game and the ruins of premodern splendor forming the center of the composition. The sweeping lawn, which appears brightly illuminated by the morning sun, unites these elements and reinforces the sense of improvement and leisure. While the sweeping nature of the view attests to the aesthetic priorities of the print, the presence of the draftsman in the image derives from the tradition of the “eye witness” associated with more scientific visual documentation (Smiles 2000). The figure of the antiquary (embodied in the Rückenfigur of the draftsman and perhaps the gazing figure in the center of the image, if not in the other three), which occurs in several subsequent prints, appears here for the second time in the series, and for the first time in the plural (cf. VII). The caption makes the abbey’s great wealth a focal point of its historiography. Though the caption offers a much more confined space for historical interpretation than do the letterpress sheets that began to accompany the Vetusta Monumenta engravings in 1763, it effectively focuses attention on the abbey’s wealth by stating the annual income from its agricultural lands, which extended as far as Borrowdale in the Lake District. This emphasis is at odds with the asceticism of the Cistercian order, which the originally Benedictine abbey was compelled to join quite early in its history (1147), as also noted in the caption. The Cistercians were permitted to receive grants of land, though not of money. Large grants of land were more readily forthcoming on a remote peninsula in northwest England than they were in the more developed plains of Dijon, where the Cistercian mother house of Citeaux was situated. The early abbots of Furness turned these grants to good account, building large flocks of sheep that grazed along the rugged fells of Lancashire and Cumberland. Thus wool exports substantially augmented the abbey’s wealth in land, established by Stephen’s original gift and soon increased by additional estates: “within a short time the abbots enjoyed the status of great border barons with feudal independence over a huge territory” (Fergusson 1984: 55). An ambitious building program begun by 1160 extended the nave to ten bays west and renovated the east end of the church originally completed in the 1140s. The cloister was begun in the early thirteenth century, using the same native red sandstone; five impressive archivaults remain from the cloister’s eastern range, along the chapter house porch. After a gradual decline in the size of the community in the fifteenth century, Furness became “the first of the major monasteries to be suppressed” on 9 April 1537 (Wood 2008: 10). Although the eighteenth-century antiquaries recognized the wealth and power of Furness Abbey as reflected in the scale of the ruins, their specific importance for architectural history was established much later. The abbey church seen here from the east is cited by Fergusson (1984: 55) as the first English church built in the Early Gothic style. Fergusson gives three reasons why this innovation might have happened in a remote corner of northwest England in the 1160s: first, Furness was geographically isolated from the more established Cistercian abbeys of the Northeast and second—partly for that reason—it was more directly under the influence of France, from whence its architectural innovations were imported. A new abbot was installed by papal fiat in 1149 in response to a “rebellion” of this established English community, the members of which did not wish to follow their French Savigniac brethren in adopting the Cistercian order, or “ascribe themselves to the Cistercians,” as the Latin caption has it. The new abbot, however, together with a master mason apparently trained at Laon, extended the nave and then rebuilt the east end of the church originally completed in the 1140s. The “destruction of Furness I” was dictated by this new architectural plan, which “affirmed Cistercian orthodoxy” (Fergusson 1984: 56), an affirmation that would have seemed more urgent at Furness than at Fountains and other English abbeys where the Cistercian order was already well established. The main structural innovation, expressing what Fergusson calls the Cistercians’ “intense interest in light,” was “the appearance of a middle story used in conjunction with . . . [a] vaulted interior” (Fergusson 1984: 64-65). Both the massed pointed arches supporting the aisles and the middle story, a clerestory with round-arched windows, are clearly visible to the left and right of the central arch in the print (the upper story had already fallen by this time). In the course of the eighteenth century Furness Abbey became widely known through a large variety of prints and paintings as well as through antiquarian and literary texts. In the nineteenth century, several literary treatments by Wordsworth and sketches by Turner and Ruskin helped to establish it, along with Tintern Abbey, as a quintessential Romantic ruin. Vertue’s print of the abbey played a significant role in this popularization, contributing to the revival of interest in abbey ruins sparked in 1718 by John Stevens’s English translation of William Dugdale’s Monasticon Anglicanum (originally published 1655-73). The continuing authority of Vertue’s print is suggested by Thomas West’s decision fifty years later to re-engrave it for his Antiquities of Furness (1777) rather than commissioning a new drawing. The modern historiography begins with a substantial entry on Furness in Dugdale and is extended by detailed attention to other abbey churches modeled on Furness, such as Holmcoltram, in Stevens’s The History of Antient Abbeys (1723). A new edition of Dugdale’s Monasticon (1817-1830) featured a large new print of the same east view of the abbey ruins by John Coney (Wood 2008: 18). The abbey ruins increasingly featured as an aesthetic object outside the antiquarian context; beginning with William Gilpin’s sketch and description for Observations Relative Chiefly to Picturesque Beauty (1772; 1786), the ruins became an essential station on the tour of the Lake District. An etching of the abbey ruins appeared on Joseph Wilkinson’s Select Views in Cumberland (1810), for which Wordsworth wrote a lengthy introduction that became the basis for his own Guide to the Lakes. His famous verses on the “holy scene” of Furness in The Prelude (1805) allude to the “fractured arch” featured in the center of Vertue’s print. Inspired as much by West’s antiquarian research as by the practice of picturesque tourism, Radcliffe imagined the monks at Furness taking in the sea view of from the watchtower above the abbey and “indulg[ing] . . . [a] sigh of regret” over “the world they had renounced” (Radcliffe 1794: 180-81). It is difficult to decide at this distance whether the tourists depicted in this print imagined the monks in the same way, though it seems clear enough that the producers of Vetusta Monumenta would have agreed with Radcliffe that “the finest view of the ruin is on the east side” (176). Radcliffe’s term “sentimental beauty” captures a more durable aspect of the representation of ruins that may be traced in Italian landscapes of the seventeenth and eighteenth centuries (for example in Giovanni Battista Piranesi’s many prints of Roman ruins) to Roger Fenton’s photographs of Furness Abbey in the 1860s. Victorian photographs showing tourists seated in the well-preserved sedilia at Furness suggest a mode of sympathetic identification inherited from the tourists depicted in this print in 1727. No text accompanies the image, and from an archaeological point of view it is still a far cry from the precise elevations and ground plans published by Thomas Beck in 1844 or the reconstructions of architectural sequence by William St. John Hope (FSA) in the 1890s. Nonetheless, this print faithfully records the state of the ruins in the early eighteenth century, including the seventeenth-century manor house (rejected as “discordant” by Radcliffe). The Furness Railway was building a station near the ruins as Beck’s work left the press, and in 1847 rebuilt the manor house and its incorporated remnants of the medieval abbot’s guest house into a hotel for passengers (finally demolished in 1954). Wordsworth inveighed against these developments in two late sonnets on Furness Abbey. In a large sense, then, the print marks an early stage in the transformation of a Gothic ruin into a tourist site, and of antiquarian documentation into a heritage industry. It also marks a kind of synthesis in the program of Vetusta Monumenta, since this subject combines the medievalism of many of the earlier plates with the Tudor period thematized in the ten prints immediately preceding this one—manifested here in the suppression of the abbey by Henry VIII, as recorded both in the caption and in the ruined state of the remains. The print thus contributes to the project of “open[ing] up the monastic past to a non-professional readership,” a project initiated in 1718 by Stevens’s translation and revision of Dugdale’s Monasticon (ODNB). Unlike either the picturesque or the archaeological views of later periods, Vertue’s print shows a working landscape with a game preserve, men, horses, dogs, a mill house (the small modern structure overlooking the stream in the left foreground), and a formal garden. These topographical elements suggest the influence of the Duke of Montague, the recently elected fellow who commissioned the drawing that formed the basis of the print. His exact role is not clarified by the Society’s minutes, which merely record that the print was ordered on 23 November 1726, presented in proof the following May, when the inscription was composed, and distributed to fellows in June of that year (SAL Minutes I.193, 212); a second print run was ordered in 1735, indicating continuing demand for the print (II.86). The draftsman’s work is integrated into this working landscape, but while his gaze is directed toward the modern house, the one still figure at the center of the composition seems lost in contemplation of the 287-foot perspective of the ruined church, closed by a single large tree as in the Bucks’ print of the same year. By taking this central figure as our proxy in viewing the print, we enter through the artist’s work into the strange yet familiar space between objects and history. Dugdale, William. 1718 [1655-73]. Monasticon Anglicanum. Trans. John Stevens. 3 vols. Fergusson, Peter. 1984. Architecture of Solitude. Princeton: Princeton UP. Myrone, Martin. 2007. 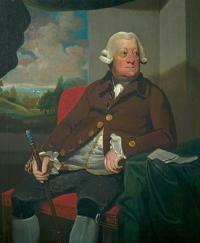 ODNB entry for John Stevens. Radcliffe, Ann. 2014 . Observations during a Tour to the Lakes of Lancashire, Westmoreland, and Cumberland. Ed. Penny Bradshaw. Carlisle: Bookcase. Stevens, John. 1723. The History of Ancient Abbeys. 2 vols. West, Thomas. 1774. The Antiquities of Furness. London. Wood, Jason. 2008. “Visualizations of Furness Abbey: from Romantic ruin to computer model,” English Heritage Historical Review 3.1: 9-36. Wordsworth, William. 1932. The Complete Poetical Works. Cambridge, Mass: Houghton Mifflin. John Brownbill. Remains, Historical and Literary, Connected with the Palatine Counties of Lancaster and Chester. Vols. 9, 11, 14, 74, 76, 78. Manchester: Chetham Society. Dade-Robertson, Christine. 2000. Furness Abbey: Romance, Scholarship, and Culture. Lancaster. Hope, Sir William Henry St. John. 1900. “The abbey of St Mary in Furness, Lancashire,” Transactions of the Cumberland and Westmorland Antiquarian and Archaeological Society XVI: 221-302. 1 2018-02-28T11:36:47+00:00 Tintern Abbey 1 jpeg (02.28.18) [annotation for plate XXVII] media/tinternabbeyFMA01.jpg plain 2018-02-28T11:36:47+00:00 Â© Cadw, Welsh Assembly Government (Crown Copyright) all rights reserved.